I do hope that this kind of thing doesn’t come as a surprise to anybody. The culture of money, power and politics in DC (or your state capital or county seat) is as bipartisan as they come. Even if he tries (and I’m skeptical), Obama isn’t going to drive the moneychangers from Capitol Hill. 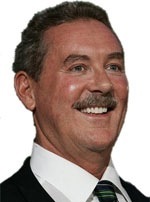 Sir Allen Stanford may be on the run today facing an $8 billion fraud charge. But back in the beginning of this decade he was pouring tons of money into Washington to help block a series of bills that would have created problems for his Antigua-based off-shore banking empire, which now appears to have been a massive fraud. At the key time, Democrats controlled the Senate, where the key actions were going to take place. And Stanford poured hundreds of thousands of dollars into Democratic coffers to help (successfully) deep six legislation he wanted killed.